This range is now obsolete. Please return to the Furnaces, Ovens & Incubators Index. 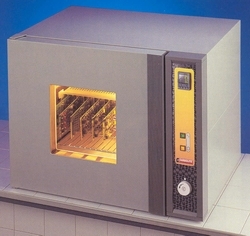 A range of chambers using either liquid nitrogen or carbon dioxide as a cooling agent, making them ideal for low temperature testing with rapid temperature changes. The normal working temperature range of the chamber is -60°C to +200°C. The maximum continuous working temperature is 200°C, although this may be increased to 300°C as an option. With the use of liquid nitrogen in place of the standard liquid carbon dioxide, the minimum temperature may be increased to -150°C. Temperature uniformity throughout the chamber is better than +/-5°C under steady state conditions, while temperature stability is better than +/-0.5°C. The outside case is constructed from zinc coated mild steel sheet and finished with light grey stoved epoxy powder paint. The internal chamber and air guides are fabricated from 304 grade stainless steel. Externally welded seams on the chamber prevent moisture from entering the insulation when the chamber is at sub-zero temperatures. The combination of high quality ceramic fibre and mineral wool blanket insulation ensures a safe outer case temperature. Chamber access is via a single hinged door which opens to give access to the full chamber width. All temperature and power control equipment is housed in a control panel mounted on the right hand side of the chamber. Heating is provided by mineral insulated metal sheathed elements; the low surface watt loading of the elements ensures that they have a long and reliable life. The chamber temperature is sensed by type 'K' thermocouples. The temperature is controlled either by a Eurotherm 2416CC programmer with 8 segments or a Eurotherm 2408CP 16 segment programmer. Power to the heating elements is controlled by a thyristor based solid state relay. The relay works in the fast cycle zero voltage switching mode to ensure good power control and to reduce the generation of radio frequency interference. Under/over temperature protection is recommended; if a fault causes the set temperature to be exceeded, then the Eurotherm 2132 on/off controller and safety contactor will isolate the elements and solenoid valve from the supply. Cooling is provided by the injection of either liquid carbon dioxide or liquid nitrogen. The cool channel of the Eurotherm controller switches the direct injection solenoid valve. For liquid carbon dioxide, a 2 metre length of flexible high pressure hose is supplied to connect directly to the CO2 cylinder. A bursting disc is fitted in the pipework to prevent excessive pressures building up in the pipes. The carbon dioxide cylinder must be fitted with a dip tube so that liquid CO2 is supplied to the chamber. For liquid nitrogen, a 2 metre length of insulated flexible stainless steel pipe is supplied to connect directly to a self pressuring dewar. Pressure relief valves are fitted to prevent any build up of excess pressure in the pipework. The chamber is fitted with a motor/fan unit and an air guide system to circulate the air within the chamber. The fan is mounted at the rear of the chamber and the air flow is horizontal through the chamber from left to right. Options, including windows and cable ports, are available - please ask for details.